I just love anything thats Japanese. Anime, crazy tv shows, culture, technology, and of course food. Japanese chicken wings or tebasaki is pretty famous in Nagoya, Japan. My first exposure to these tasty chicken wings was at Furabio. They were sticky, sweet and covered in sesame seeds. Few years ago, I had lunch with a friend. She brought me to Tebaya, a tiny shop that specializes in tebasaki. They also sell yummie sandwiches. I remember it being quite good so last last Friday I had lunch with my friend, Steph. She works close to Tebaya so that was another reason why I wanted to go there. 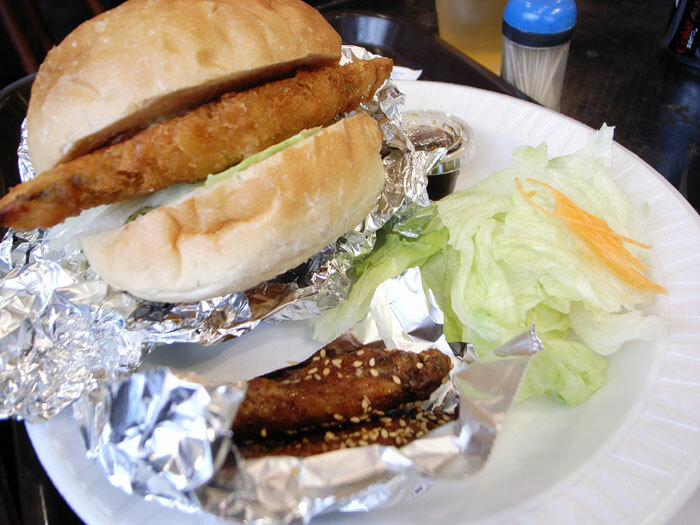 I was excited to go there because I wanted to try the cream crab croquette sandwich. When I walked up to the counter I was ready to order that sandwich in a combo that came with 2 wings, a salad and a drink. Sadly the lady told me they don’t make that anymore so I ended up get the same combo but with a fried fish sandwich. We had to wait a bit for our lunches. The salad was just your typical Japanese salad and it was a bit sad looking. The sandwich looked pretty big but it was mostly bun. The piece of fried fish was a little too thin. But the bread was great. I really love Asian bread, they tend to be on the chewier side. The wings were pretty good as well. Overall it seemed everything was okay. I remembered loving the place the first time. I’ll probably go back again for their sandwiches, love love the bread.